Tips for creating your genomics tool, platform updates, and success stories. From the engineers powering the Genomics Revolution. Spring has arrived at DNAnexus, ushering in important updates! 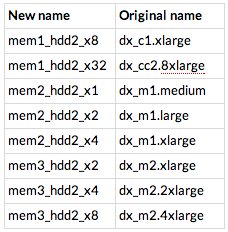 Starting May 1, 2014, we are excited to announce your analyses on DNAnexus will be faster, thanks to new instance types . What does that really mean? Here’s an example before we dive into all the details… A specific exome pipeline (e.g., BWA-MEM, GATK-Lite) now runs in less than 4 hours! Previously, the run would have taken nearly 6 hours. We believe, and hope you do too, that DNAnexus is the best choice for expanding your genomic analysis infrastructure. Because, unlike local equipment, which from day one starts collecting dust in your server room while technological advances pile up, the cloud is always on the forefront of computing technology as newer, faster hardware is made available. These new hardware options are in the form of new instance types (virtual computer configurations) on which your cloud analyses can run. And thanks to the flexibility and reproducibility aspects of the DNAnexus platform, you can start using these new instance types right away—simply launch your existing analyses on one of those new instance types (e.g., using the “–instance-type <…>” option of our “dx run” command-line tool) and enjoy a completely effortless hardware upgrade! The new instance types are built on high-frequency Intel® processors of the Sandy Bridge and Ivy Bridge microarchitectures, support the Intel® Advanced Vector Extensions (Intel® AVX), and have solid-state drive (SSD) local storage technology for fast I/O performance. the suffix (x2 through x32) denotes the number of cores. We liked the convenient new naming scheme so much that we have applied it to existing instance types as well, as shown in the following table. Compared to the new instance types mentioned earlier, the existing instance types are distinguished by a different storage infix (hdd2), given their regular hard disk drive technology. More information is available on our wiki page, which explains the new naming conventions and includes a detailed list of all instance types. To ease the transition, existing instances can currently be called by either their original name or the new name; the DNAnexus system understands both. However, we encourage you to adopt the new names in a timely manner to avoid any future interruption. We are very excited to announce these important updates, and we cannot wait to hear your success stories out of them. Drop us a note at support@dnanexus.com if you’d like to get in touch with us.